In 2018, the international economic development environment witnessed a growing complexity, but the domestic economic development enjoyed a sound momentum. Along with the consumption upgrade, young people emerged as the main consumers. Under the new era background, the home textile industry should seize every opportunity, readily face up to every challenge, and actively head towards the refined and high-value-added industries, thus creating a more comfortable and fashionable home living environment for consumers. Because of the reform of the retail industry, the home textile industry should think about how to promote non-boundary retail at an opportune time to realize user, goods, and trade scenario digitization. Following the digitization, the online and offline delivery experience will be further integrated. Driven by the acceleration of the consumption upgrade, the home textile industry would experience a recovery. The current stage is experiencing a steady improvement of brand and product demand upgrade and the industrial concentration degree. Major listed companies in the industry demonstrated favorable performance. Take the first half of 2018 for example. l Industrial emphasis on brand and channel construction. According to analysis results of Jingdong Big Data, China’s current retail amount has been close to that of the United States. Fueled by the overall consumption upgrade, and urban-rural integration construction, residents’ expenditure of home textile products experienced huge changes. Consumption is no longer in a position to just satisfy basic functions. Some emerging forms of the retail industry revolve around living scenarios, and China is the most promising market in this aspect. Consumers’ purchasing power and brand awareness have kept on strengthening, and the consumption habits have transformed from a price orientation to a brand orientation. 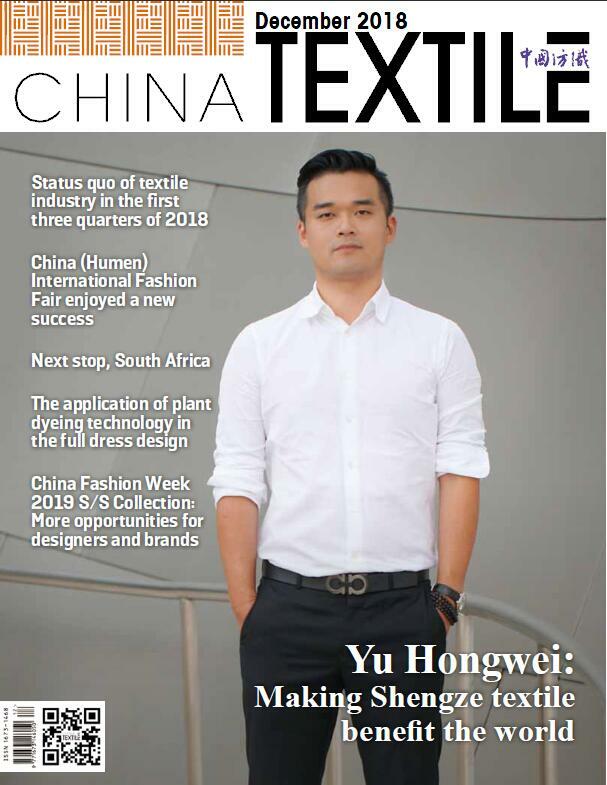 Faced with the rapidly-growing youth-oriented market, the home textile industry in 2018 also changed from an extensive growth mode to an intensive growth model. Backbone enterprises set a good example in brand construction, channel construction and supply chain upgrade. In response to the rapidly-growing consumption market, the transformation and upgrade pace of the home textile industry was adjusted to achieve a synchrony. Unremitting efforts were made in branding, channel construction, and intelligence construction. Nowadays, consumers are concerned about not only product quality, but also the cost performance ratio rather than blindly buying the expensive commodities. In terms of the shopping habits, consumers demonstrated a stronger willingness to share their shopping experience on social media. Extensive application of mobile terminals has fueled the passion of consumers for online shopping on holidays and festivals. The consumption upgrade has already been unveiled. How should the home textile industry facilitate its structural adjustment, and realize the supply-front reform? How should home textile enterprises develop and turn out high-quality products proceeding from market demands? The answer given by the China Home Textile Industrial Association is to proceed from the market, lead enterprises to constantly improve their quality, realize high-quality development, and genuinely satisfy consumers’ personalized and diverse development demands. “Everything should proceed from market demands”. This is the best description of product R&D and channel model transformation of current home textile enterprises. As the home textile industry is losing their traditional advantages, and the consumption upgrade is further accelerated, the low-cost competition models can hardly sustain. To reduce the inventory, improve the quality, and strike a balance for he supply and demand has been an imperative. In 2018, the industrial beacons ― home textile exhibitions ― were committed to improving quality. On the one hand, enterprises were encouraged to demonstrate their high-quality home textile products and promote the transformation of the home textile industry to a medium-and high-end level. Besides, enterprises were led to upgrade their service and channel models to better satisfy consumers’ personalized customization needs and scenario life experience. On the other hand, exhibitions and other relevant activities also aimed at high-quality development. A high-profile exhibition, “2018 Andrew Martin International Interior Design Summit” invited many top-grade designers, artists, and industrial elites to Shanghai to organize a series of communication revolving around design issues. Besides, the cross-field marriage between the home furniture enterprise and the home textile enterprises was also organized in the form of road shows to find the target consumers more precisely and effectively. In recent years, that the home textile products have found a close combination with fashion trends can be obviously observed in many exhibitions. The single-color and concise design has been more and more popular. Fewer colors and simple decorations have allowed the line texture to further highlight the tension of spatial design. The concise styles have won favor from many customers. Changes of the industrial development are actually the outcomes of structural adjustment. In the final analysis, the adjustment of the industrial structure is an adjustment of the market structure and product structure. The home textile exhibitions have become a barometer, which can quickly and accurately reflect changes of the industrial structural adjustment comprehensively, and this is probably a major reason for so many professionals attending the exhibition annually. At the same time, consumers’ brand-new demands of home decoration styles and tastes have provided the soil for the whole-house decoration customization. When the demand keeps on strengthening, the “whole-house decoration customization” is no longer a fashionable key word and has even become a new era of home living consumption. In response to the market and fashion trends, a growing number of furniture enterprises have joined the list of “whole household decoration customization”. To realize the whole household decoration customization, the cloth soft decoration in line with the overall decoration style should be found out, and home textile exhibitions exist as favorable platforms. Through precise matching and in-depth connection, the “cross-field cooperation” platforms created by home textile exhibitions can create more possibilities for innovation. Under the new situation, Chinese home textile enterprises are reinforcing themselves. First, enterprises gave full play to their craftsmanship, emphasized on their quality improvement, show full respect for intellectual property rights, promote brand strategies, and create regional brands, terminal brands and manufacturing brands. Second, enterprises strove for improvement of their efficiency. Against the backdrop of all-around cost increase of factors of production, enterprises pursued efficacy via efficiency improvement so as to realize automation and technological upgrade of home textile industries, improve the personnel qualities, and realize skill improvement. Third, enterprises attached great importance to new models. This year, the cross-field cooperation was genuinely realized among the enterprises. For example, a deeper cooperation with furniture enterprises promoted online and offline integration. At the same time, with the promotion of the “Belt & Road” construction, a new pattern is shaping for the global textile economy in the new era. There are two main channels for Chinese textile enterprises to go global. One is to realize cross-border layout of productivity through the greenfield investment cooperation to form a global rapid response manufacturing base layout model featuring “China plus surrounding countries plus Africa”. The other is to achieve vertical extension and control of raw materials, design, R&D, brand and market channel resources on two ends of the industrial chain through foreign direct investments, mergers and acquisitions. Besides, the international layout of the future textile industry needs to discuss opportunities for productivity layout cooperation among China-Southeast Peninsula, Sino-Brazil Economic Corridor, Bangladesh-China-India-Myanmar Economic Corridor, China-Central Asia, and China-Africa. Via the “Belt & Road” initiative, the home textile industry will further enhance international cooperation, visit relevant countries, and explore the Silk Road Economic Belt despite of the overwhelming pressure of the Sino-US trade frictions.